addicted2comics( )'s Alphabet Review Thread!! Yup, it's my turn! Slow start, but here's my marathon reviews upcoming! See for yourself-if you dare! Yes, I swiped dad's formatting from the profiler, but his is better!!! Speaking of swiping, watching this whole movie again, which I have seen numerous times since I was a little kid, reminded me that there were a pair of Illusion-O glasses that would help you see the ghosts, but as little kids often do---I wrecked them. I am so regreting it now. I was struggling to much to see the details, I caught myself saying, "Where are the glasses???" I haven't seen this in a long time, like, I remembered the ghosts. But I also remembered Ben as such a swell guy. A real sweetie. Now that I'm older, I can understand more, and I saw how he was really portrayed. He lied to the family, killed Dr.Zorba, and set it so that the little boy would be murdered to please the spirits. I gotta admit, even with this being in black and white, which to me always takes away from how real it feels, all the ghosts and moans I admit gives me the creeps. (Just a LITTLE but it does.) Very nice work! Especially for the time! 1960? Not bad! Disney makes this beloved musical more magical than ever with an all-new, feature-length production! Featuring an all-star cast and new choreography, this charming tale of an adorable orphan named Annie captures all the fun of the original — but adds an unmistakable Disney touch! For a young girl living a "hard-knock life" in a children's orphanage, things may seem pretty bad — especially at Christmas. But feisty Annie carries a song in her heart and hope in her locket — the only thing she has from her parents. One day, fed up with the dastardly Miss Hannigan (Academy Award® winner Kathy Bates*), Annie escapes the run-down orphanage determined to find her mom and dad. Her adventure takes her from the cold, mean streets of New York to the warm, comforting arms of bighearted billionaire Oliver Warbucks — with plenty of mischief and music between! 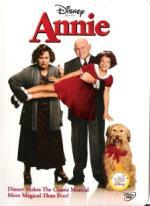 Filled with memorable songs and magical moments, Disney's Annie brings this heartwarming story to a whole new generation. And now you can relive the magic over and over again! I remember when I first saw this. It was another version, but still close. I saw it at school never did finish it. I always did like to see this. Maybe around Christmas time. I also always like a good musical, but I suppose my father would disagree on the matter. One thing I don't like it how many songs. Like I said, I love it being a musical, and I LOVE "Hard Knock Life", "Easy Street" and "Little Girls", so my question is.....are the rest really nessicary? Ok, yeah, I know the answer to that: part of the magic, blah blah blah. I may like music, but you get tired after a little while. Still, it was very enjoyable. anyone who knows about her. Will the Bratz be able to save their new friend from the clutches of ruthless villains? Can Katias powers save the Bratz and the world? Or will the girls have to make their own magic? 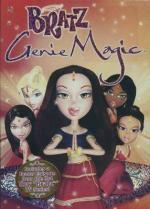 Join the Bratz as they enter the mysterious and exciting world of Genie Magic! My Thoughts: Well, it was enjoyable......alot to the point that I made my dad suffer through it with me. Still, It's been a while since I watched this, and I"ve forgotten just how girly it is. While I admit I LOVED Bratz a couple years ago, my eyes have opened. The girl thing is just over the top. And this is coming from a girl. I mean, it was tolerable, and I like the teenage-girl angle and point of view in these movies, it just could have been done better. The secret-agent acvtion stuff was a good twist to the movie too. It makes me wanna see Bratz Rock Angelz again and remember that horrible ex-boss of Jade's, Birdeen Maxwell. That movie is also where the secret agent thing started, so I think after the marathon I'll dig that up again. Luckily I had my computer here to keep me entertained during the movie. Patience Philips is dead – and more alive than ever. Murdered after she learns the secret behind a cosmetic firm's anti-aging cream, she's revived and empowered by mystical felines. Now she's on the slinky prowl for adventure and revenge. She's Catwoman. Academy Award® winner* Halle Berry plays the sleek, whip-cracking feline fatale, Benjamin Bratt is a cop torn between romance and duty, and Sharon Stone is an ice-blooded supermodel with something to hide in a kicky and stylish Catwoman. With catlike grace, a knack for landing on her feet, a passion for sushi and a loathing for dogs, Berry is a perfect force to reckon with. She's action. With attitude. *2001: Best Actress for Monster's Ball. I've seen this a few times befoire, and anyone who knows me on here knows I'm all about the supers! I still can't help but feel that if there's a Catwoman, then there should be a Batman. That didn't stop me from liking this. There is just something udescribable about this movie. I guess I just love the idea of total freedom......that and evil make-up. I never did goop up my face like that. Fifteen-year-old Patrick (Zac Efron, Hairspray) doesn't know what he wants to do with his life, and the pressure put on him by his dad isn't help.ing. But then he meets a misunderstood horse trainer (Bill Cobbs, Night at the Museum) who convinces him to train for the Derby Cup. Can Patrick convince his parents to let him compete, beat out the rich town bully–and find the champion that lies within? I've had this for I'm not sure how long, but never watched it, so this is a first-time viewing. Not much to say here except it was really slow and hard to get into in the begining, and alot of this movie is very predictable. Still, it ended in a heart-tugger and it was kinda fun. Dude, he gave it a 2.5!! I don't get it. Probably where I said while I do see it as a bad movie... I did enjoy it. But that is me... I can enjoy bad movies for what they are. More a generalisation. Your Dad can be relied upon to find something good in even the most terrible films! I usually like most superhero movies..or movies with comic book characters in them. But Catwoman is one of the few that I don't like. The idea behind the plot is interesting, but this isn't Catwoman...that is Selina Kyle and Batman should be around or at least mentioned. Berry's characters is just a generic catwoman. If you liked 'Aladdin', you'll love Disney's 'The Emperor's New Groove', where outrageous comedy rules! Audiences and critics alike raved about this hilarious animated adventure: Ebert & Roeper And The Movies gave it "Two Thumbs Up." Faster than you can say "boom, baby," arrogant Emperor Kuzco (voiced by David Spade) is turned into a llama by his devious advisor, Yzma (Eartha Kitt), and her hunky henchman, Kronk (Patrick Warburton), who want to rid the kingdom of this beast of burden. Now the ruler who once had it all must form an unlikely alliance with a pleasant peasant named Pacha (John Goodman). Together, Kuzco and Pacha must overcome their differences as they embark on a hilarious, "groovy" adventure that will have you howling with laughter. There's something for everyone in this "hip, funny movie" (Gannett News Service) with its dynamo cast, distinctive style and great music - featuring the Academy Award®-nominated song, "My Funny Friend And Me" - all fully captured in state of the art quality created directly from the digital source, which ensures the best possible sound and picture! It was just as fun as I remembered it. All I can say, really, is that it was alot better than the series. Although, John Goodman being Pacha was odd for me, cuz every time I hear Pacha, I hear Dan Connor. Still a cool story about an arrogent emporor with a heart.......somewhere. Yeah, I was let down on that part too, but, and I never thought I'd say this about a comic character......I really like the remix of Catwoman better. It just, idk, makes more sense to me. Then again, I read Marvel, Image, Papercutz, etc. alot more than I do Dc.